Whether you need to serve a crowd for game-day or just need a dinner for a regular Tuesday night there’s nothing more comforting on a cold winter’s day than a hearty bowl of homemade chili. I’ve rounded-up 17 different chili recipes and each is unique in their own way. Some with beans, some with meat, some without and some with ingredients that might surprise you. But they all have one thing in common: they are sure to warm you up this winter. 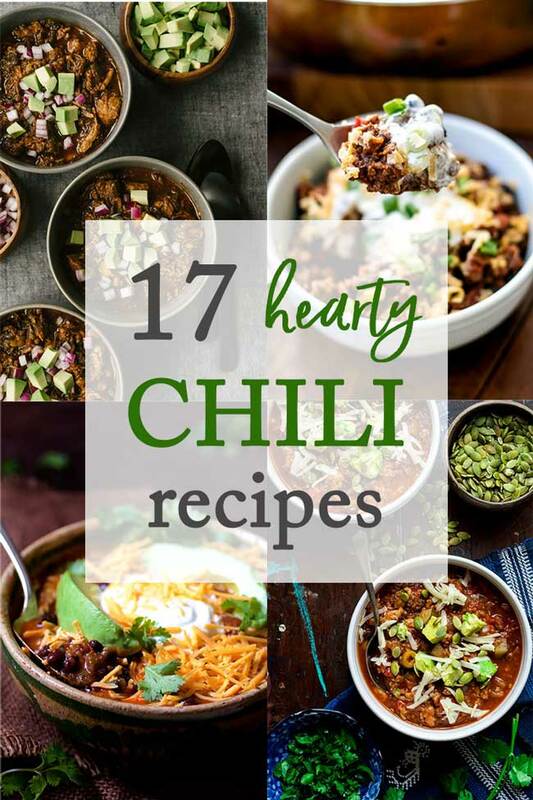 So, take a scroll and check out all 17 chili recipes – I hope you find a new one to try! Click on the photos or recipe titles to get more details about each of these delicious chili recipes! 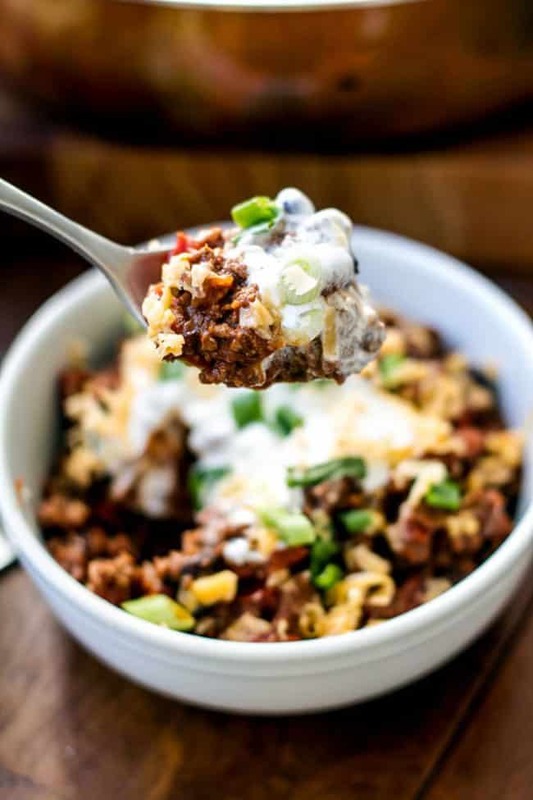 EASY GROUND BEEF CHILI – Girl Gone Gourmet | I consider this my “all-purpose” chili – it’s great served up in bowls, or with baked potatoes, or as a Frito pie (one of my all-time favorite guilty pleasures). 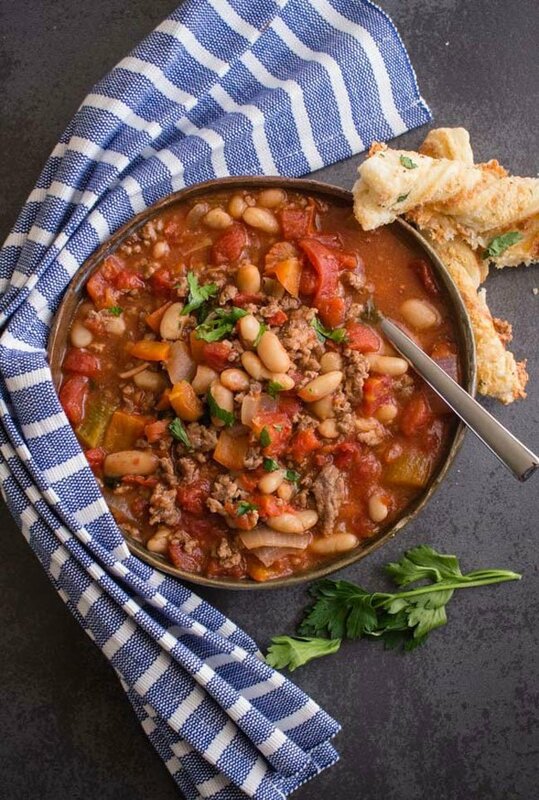 It’s inspired by the chili my mom used to make for us growing up – it’s simple, hearty and feeds a crowd. 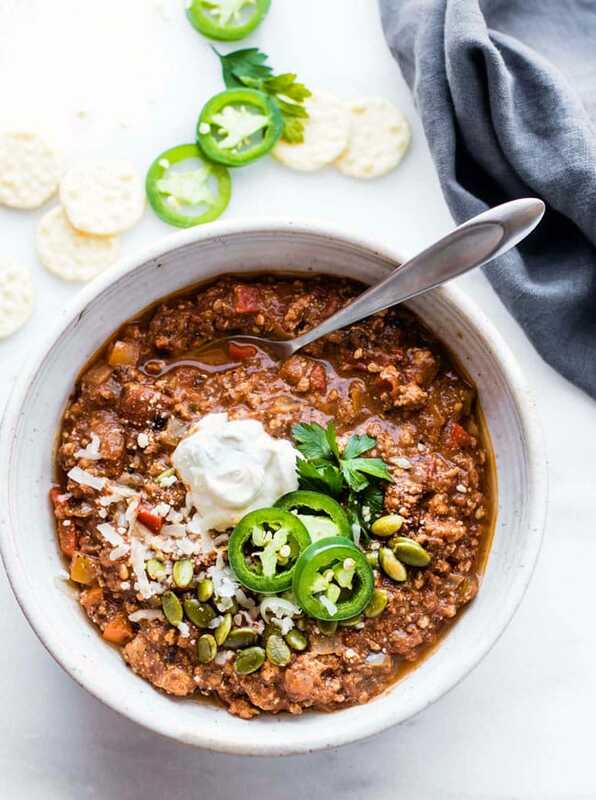 SLOW COOKER SOUTHWEST BEEF CHILI – Chili Pepper Madness | First, you should know that Mike and Patty of Chili Pepper Madness are chili experts, so any chili concoction that comes out of their kitchen is sure to be a winner. 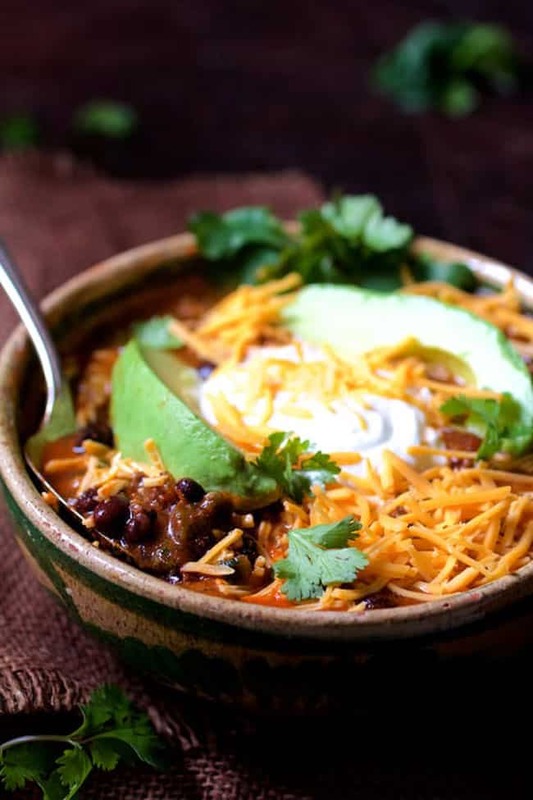 I love the flavors in this Southwest-style chili – lots of poblano peppers, fire roasted tomatoes, and Southwest seasonings. Everything goes in the slow cooker to cook all day, so this is a great recipe for game-day or other get-togethers. Also, if you’re a chilihead (as Mike likes to say) be sure to check out his book. The Spicy Dehydrator Cookbook available for preorder now. 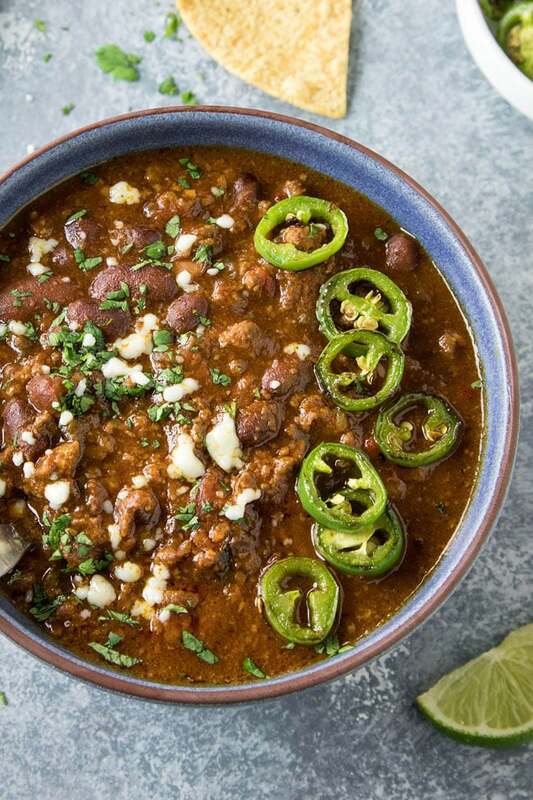 BEEF AND CHORIZO CHILI WITH BLACK BEANS – From a Chef’s Kitchen | This recipe is scaled for a crowd and is full of Mexican chorizo, beef, and black beans. 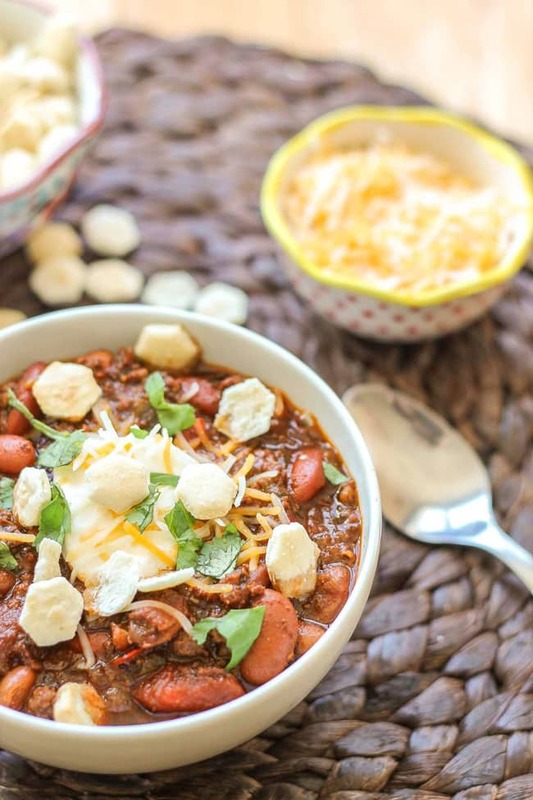 I love the addition of red wine, the not-so-secret ingredient, that elevates the flavor of this delicious chili. 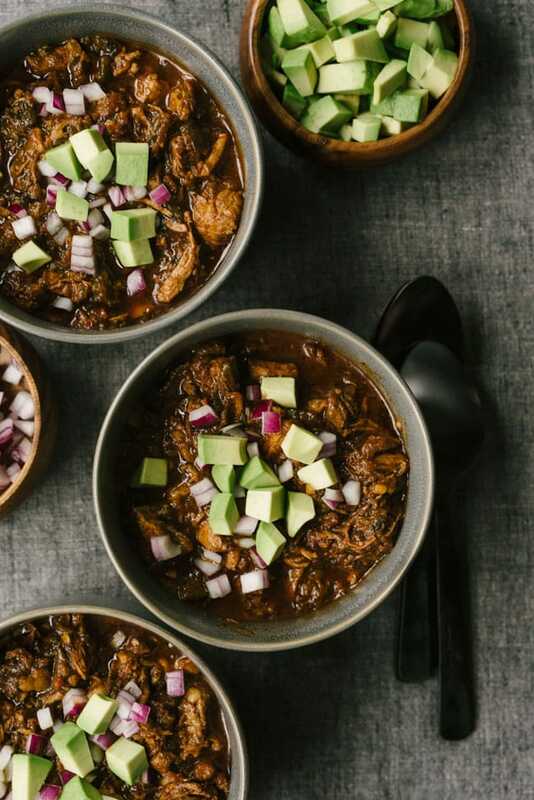 QUICK SWEET POTATO MOLE TURKEY CHILI – Cotter Crunch | This simple bowl of chili is not what it seems because there’s a beautiful sweet potato mole sauce that makes up the based of the chili. And if you think it’s too complicated, please be sure to read the recipe because Lindsay’s mole sauce uses ingredients you might already have on hand in your pantry. EASY HOMEMADE CHILI – An Italian In My Kitchen | There are chili recipes you try once, but then there are the ones you make over and over again. Rosemary has one chili recipe and it’s the same one she’s made for the last 20 years. She lives in Rome, but she’s originally from Canada and so she understands comfort food and what will warm you up on a cold winter’s day. This is the sort of recipe you’ll want to make again and again – simple ingredients and easy to make! 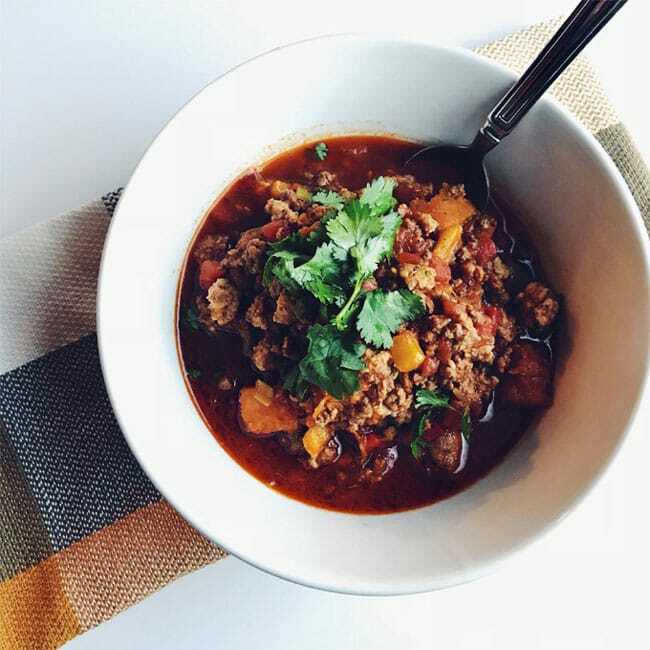 PALEO CHILI WITH BUTTERNUT SQUASH – Whip and Wander | Instead of beans, this chili has lots of tender butternut squash that goes great with the beef and other veggies. Make a big batch ahead of time and keep it in the freezer for cozy dinners on cold nights. 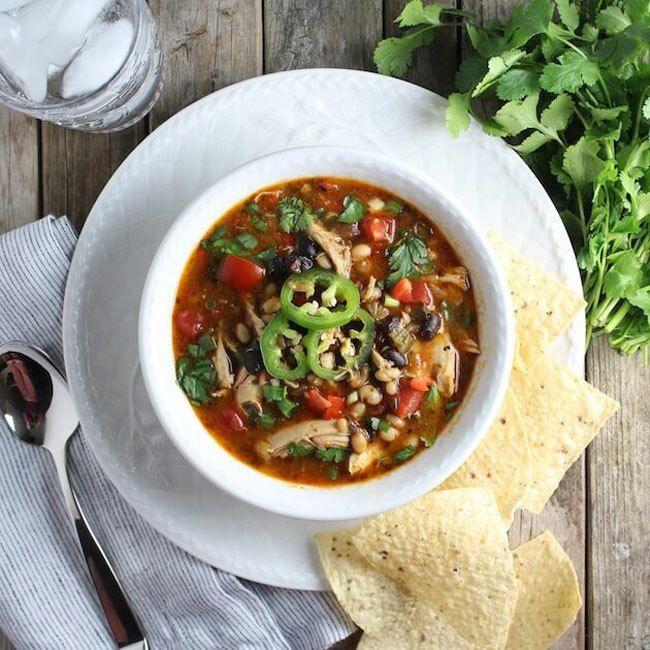 POBLANO CHICKEN CHILI – Girl Gone Gourmet | This cozy chili can be made a day in advance – just warm it up slowly on the stovetop when you’re ready to serve it. It’s packed full of poblano peppers, kidney beans, and chicken and it all simmers together in some Mexican-style beer and chicken stock. 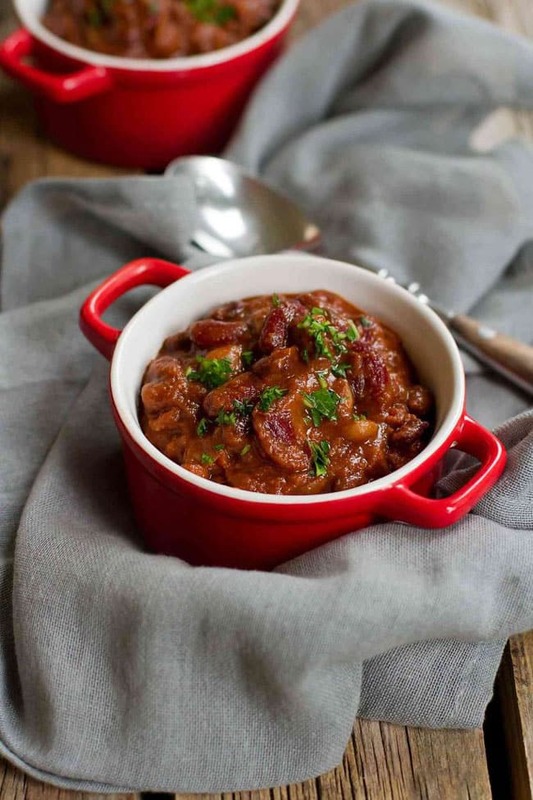 CHILI CON CARNE – Our Salty Kitchen | Both beef and pork slow cook together until they are fall-apart tender. Add some roasted peppers and plenty of seasoning and you get a big batch of chili that’s guaranteed to warm you up on a cold day. 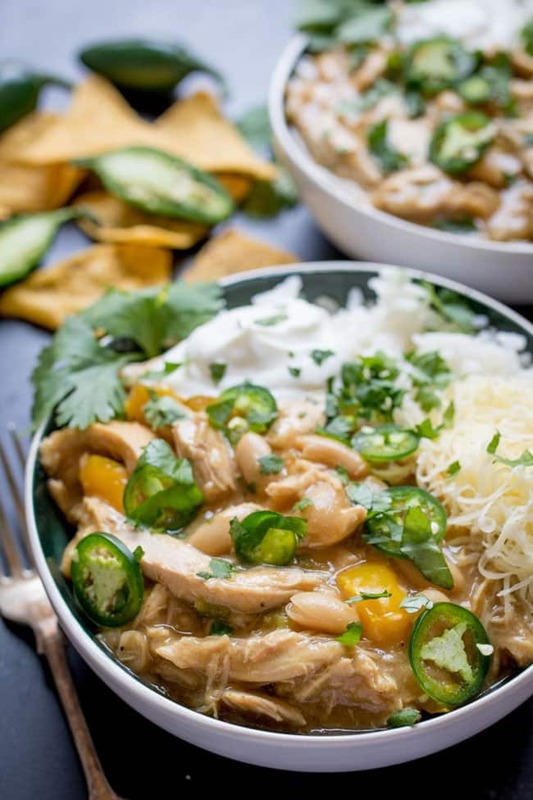 WHITE CHICKEN CHILI – Kitchen Sanctuary | Another chicken chili this time with white beans. For a little extra something Nicky serves this chili over rice – a great way to make the chili stretch to feed more people. 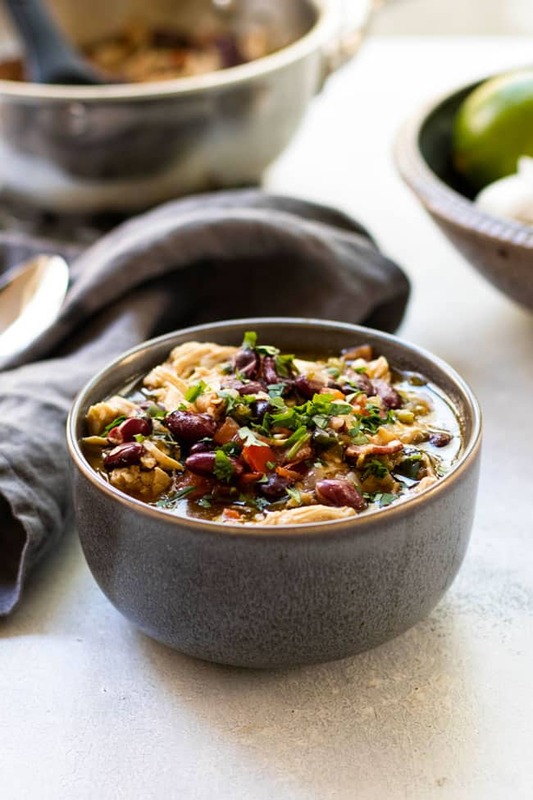 SMOKY CHICKEN CHILI – Taste and See | This chili is all about smoky flavors and Holly gives you two options to make that happen – buy your own smoked chicken OR make your own smoked chicken in the oven (and it’s not as hard as you might think!). This looks like a great weekend cooking project that you get to enjoy all week long – you get 10 hearty servings from this recipe making it a great make-ahead dinner idea. 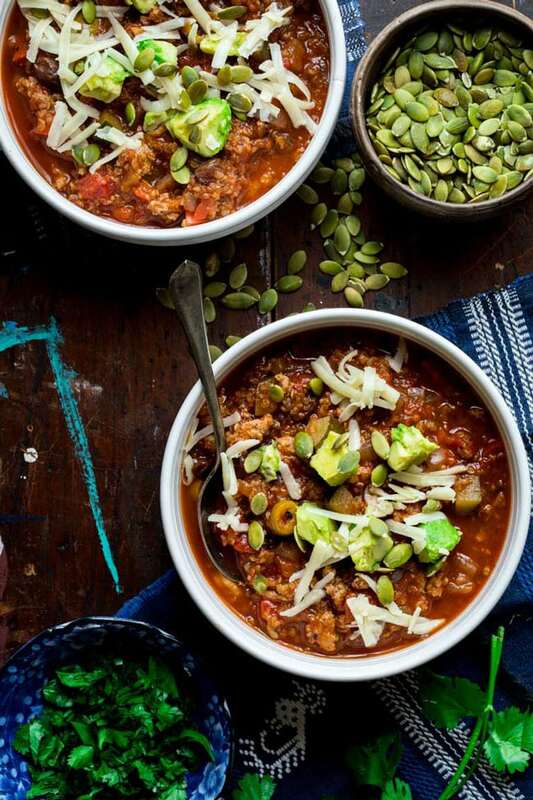 TURKEY PICADILLO CHILI WITH QUINOA – Healthy Seasonal Recipes | Katie writes at the beginning of her post that this isn’t your “everyday chili” recipe, so if you’re looking to switch up your chili-game this one is a good one to try. It’s a lighter option made with ground turkey, picadlillo-style flavors, and quinoa for a nutritional kick. 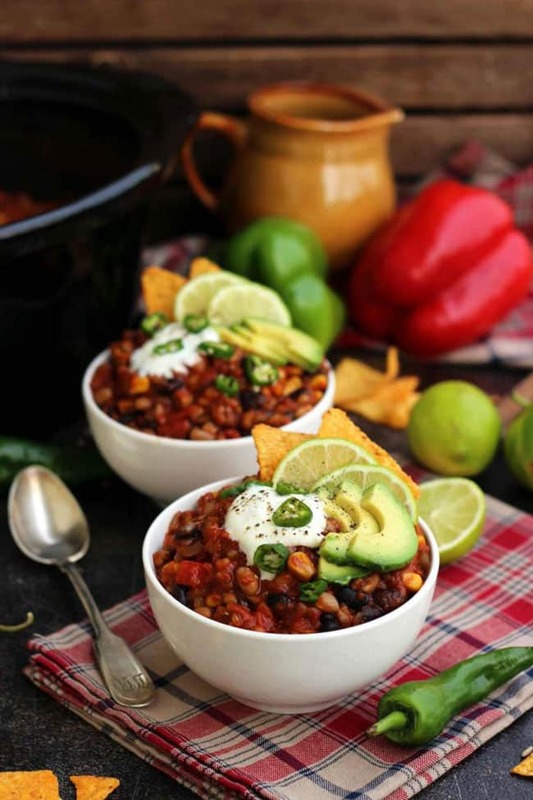 SLOW COOKER VEGAN CHILI – Happy Kitchen.Rocks | Here’s another chili packed with good-for-you ingredients like whole-grains, beans, and plenty of veggies. Plus, it cooks all day in the slow cooker! CHORIZO CHILI – Strawberry Blondie Kitchen | This chili gets a kick from some Mexican chorizo and it’s full of beans and veggies. Serve it all on its own or make a batch of jalapeno cornbread waffles to serve alongside – Megan shows you how to make them! 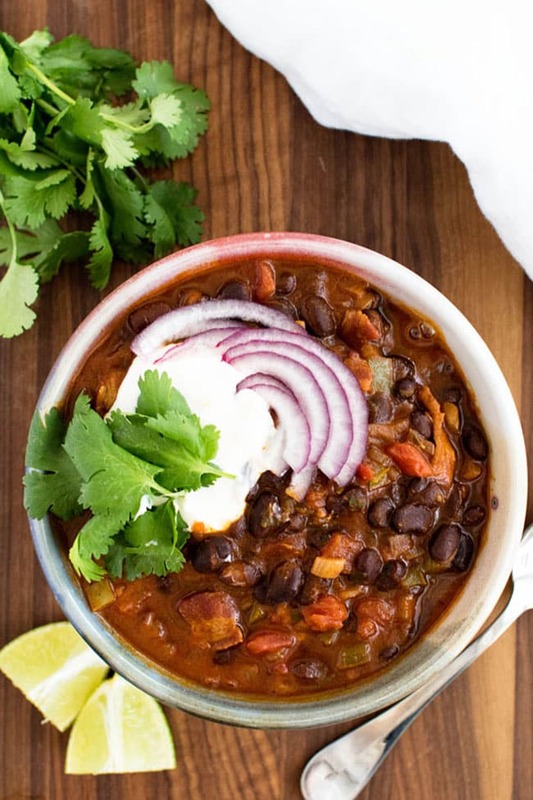 BLACK BEAN CHILI – Girl Gone Gourmet | This mostly-meatless black bean chili starts with some bacon and has a kick of heat from some green chile. 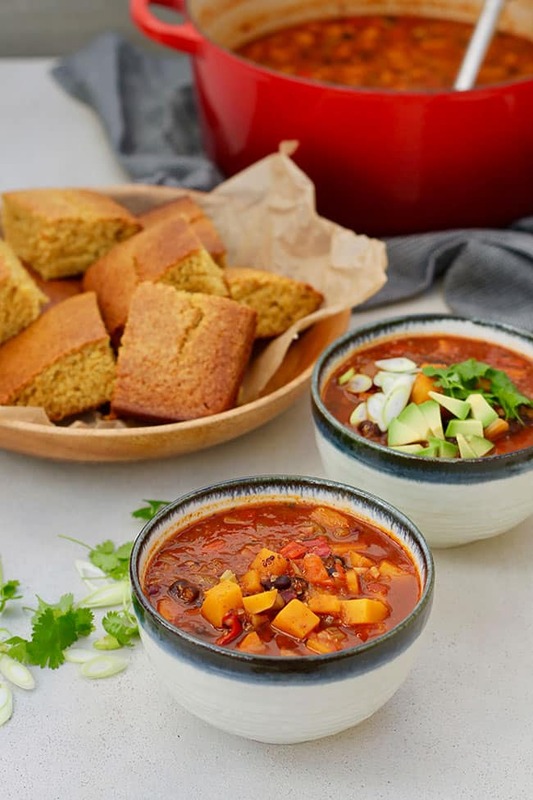 BUTTERNUT SQUASH AND BLACK BEAN CHILI – The Muffin Myth | Another meatless option with black beans and butternut squash with some chipotle peppers in adobo sauce for an extra-spicy bite. INSTANT POT VEGETARIAN CHILI – Cookin’ Canuck | Do you have an Instant Pot aka an electric pressure cooker? 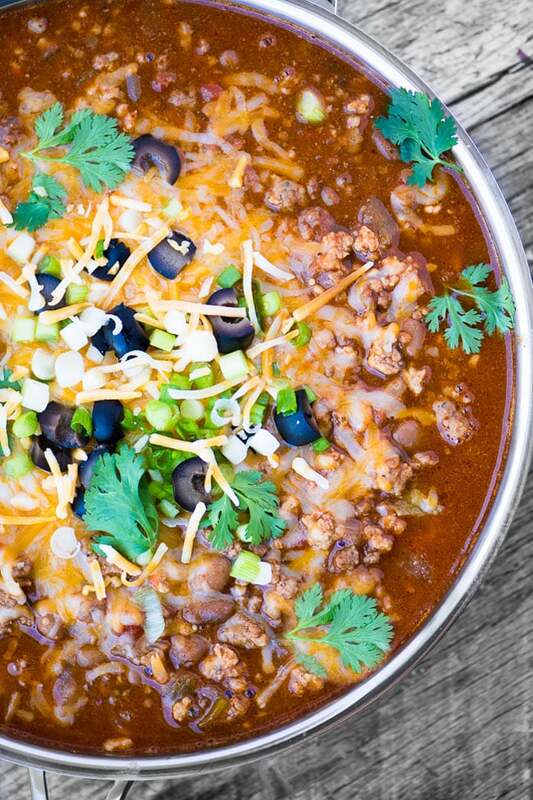 If you want a chili in about 35 minutes (!) that tastes like it was cooked all day an Instant Pot will make it happen. Dara shows you how to make her vegetarian chili, packed full of veggies, in the pressure cooker or if you’re like me and still slow-cook your chili, she also includes instructions for stovetop and the slow cooker. MEAT LOVER’S PIZZA – The View From Great Island | For all the meat-lovers! Beef, pork, and Italian sausage slow cook in beer with tomatoes, fire-roasted chilis, and pinto beans. There’s also some masa harina, a fine-ground corn flour, that helps thicken the chili.